Gatlinburg, TN (August 29, 2014) – Ole Smoky® Tennessee Moonshine is now the official moonshine of Harley-Davidson. This multi-year partnership is punctuated by year-round events and limited edition co-branded Ole Smoky Moonshine offerings. Both brands share common ideals of independence, adventure and a strong history of Americana, making the partnership a natural and exciting evolution. Launching Labor Day weekend during the Milwaukee Rally, will be the Ole Smoky hard smoked blend, Harley-Davidson Road House CustomsTM Charred Moonshine®, available with a limited edition custom jar and label. Harley-Davidson Road House Customs - Charred Moonshine pays homage to the bond amongst riders and their end-of-ride revelries at distant roadside destinations where bikes are parked and friends are gathered. Ole Smoky Tennessee Charred Moonshine is fine mountain whiskey hand crafted, smooth, slowly aged in barrels and bottled at 105 proof in Ole Smoky’s traditional mason jars. The world's best whiskey has always come from Tennessee, but Tennessee's best whiskey comes from the mountains. The commemorative jars will only be available for a limited time in Milwaukee, with limited availability nationally, and in the famous Ole Smoky Holler in Gatlinburg, TN. Later this year, Ole Smoky and Harley-Davidson will announce additional Moonshine offerings, including new product and a co-branded national marketing campaign specially crafted to bring the partnership of both brands to life. Ole Smoky’s Mini Holler (a mobile moonshine experience) will be onsite at the Harley-Davidson Museum during the Milwaukee Bike Rally celebrations serving curated Ole Smoky cocktails. 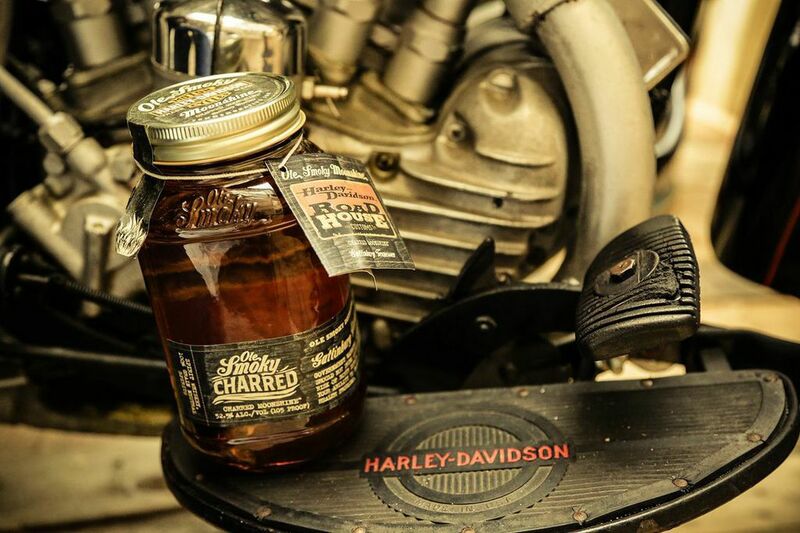 Fans will be able to try “Smoke and Coke” and other cocktails crafted with the limited edition Harley-Davidson Road House Customs Charred Moonshine. The Harley-Davidson Museum’s MOTOR® Bar & Restaurant will also offer Ole Smoky Moonshine cocktails to be enjoyed after the ride. Ole SmokyMoonshine urges riders to Shine and Ride Responsibly; never drink and ride. Currently, Ole Smoky Tennessee Moonshine nationally retails thirteen flavors of moonshine made using authentic East Tennessee recipes, jarred and shipped directly from the company’s famed Gatlinburg distillery. The Ole Smoky Moonshine™ distillery, known as The Holler™, is America’s most visited distillery and produces the brand’s signature flavors. Original Moonshine (100 proof), White Lightnin’™ (100 proof), Lightnin’ Line (80 proof): Strawberry Lightnin’, Lemon Drop Lightnin’ and Hunch Punch Lightnin’TM, and the 40 proof line including: Moonshine Cherries™, Peach Moonshine™, Apple Pie Moonshine™, Blackberry Moonshine™, Pineapple Moonshine, Watermelon Moonshine, Sweet Tea Moonshine and Charred Moonshine™ are available selectively in 49 states and Canada. Ole Smoky Tennessee Moonshine can be found at local retailers and is sampled and sold at some of the biggest music and sporting events in the country. True to its roots, each Ole Smoky Moonshine flavor is born from the hand-crafted recipes of the Tennessee families who have been filling moonshine jars and jugs in the Smoky Mountains for more than a century. For more information about the brand, please visit http://www.olesmoky.com. Find them on social media: Facebook.com/olesmoky, Twitter.com/olesmoky, Instagram.com/olesmokymoonshine.